Infrared thermography is a technique that allows to measure the temperatura of objects remotely and without physical contact, by capturing the intensity of infrared radiation emitted by those objects. Using the thermographic cameras we can convert the radiated energy, invisible to the human eye, into a visible image created using the surface temperature information of the objects. Thermographic cameras work like a thermographic scanner on an object. The image captured by the camera shows in each of its points information about the temperature of the object. Infrared thermometers are useful for single-point temperature measurement. However, when analyzing larger areas we will need the use of a thermal camera. The thermographic camera can measure an specific point as well as giving us a view of the temperature in different zones of a certain area. Infrared-based thermal imaging cameras allow us not only to measure the temperature of a single point but all the points captured by the image. In the application of thermography to the industry, during the last decades infrared (IR) scanning systems have been used to control the temperature of the furnace cover. These systems are mainly based on a 45˚ rotating mirror that captures temperature measurements over the length of the furnace in each rotation, directing the energy it captures to a single IR temperature detector. With the new developments of uncooled microbolometers, their price / performance ratio and the trend towards mass production, the use of thermal camera-based monitoring systems in these applications has become increasingly popular. These new systems can offer innovative solutions to the general requirements in industrial plants that require temperature monitoring. Among the different advantages of the use of thermal imaging cameras we highlight the following. 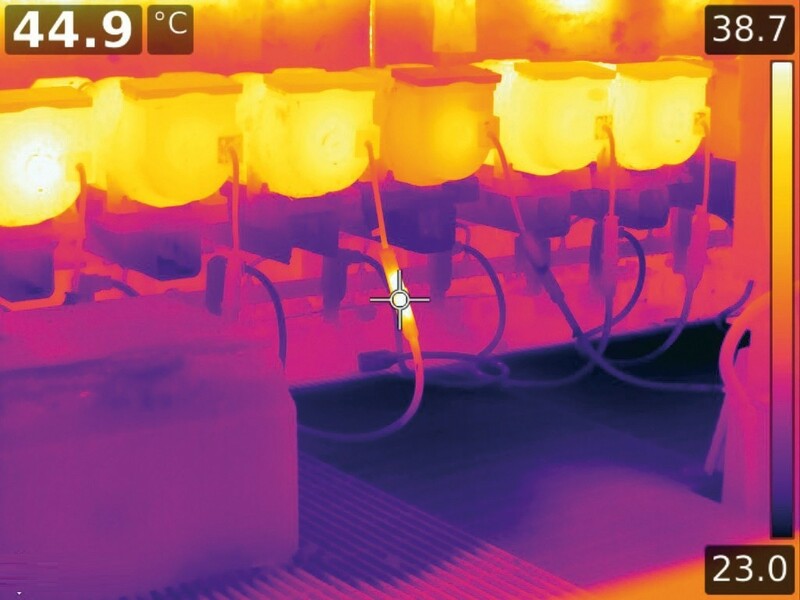 Thermographic cameras allow to obtain images of the temperature distribution in electrical and mechanical equipment. These infrared thermography cameras translate, through complex algorithms, an infrared image into a radiometric image that allows temperature values to be measured. Thus, for example, high anomalous temperatures (system overheating) are detected, which are, in many cases, the situation prior to costly failures in electrical and mechanical installations. It allows a more reliable preventive maintenance. Thermographic cameras are used in the evaluation of energy consumption in facilities or production lines. These systems allow to know the points in which inefficiencies of refrigeration systems, heat losses or anomalies in the insulation of refrigerated chambers, among others, occur. The measurement of temperature using thermographic cameras allows the monitoring of temperatures of objects, materials and substances that do not allow to be contaminated by physical contact. The leaks of chemical and flammable substances can be the source of emissions of toxic gases, fires or explosions, which can have serious consequences in the facilities and their surroundings. The thermographic cameras allow an early detection by measuring the temperature. The provide accurante information on the location of small leaks, facilitating a quick reaction and minimizing the volume released. In general, thermal imaging cameras are becoming an alternative and attractive solution for the monitoring requirements of industrial plants. They can provide real-time inspection and the images allow the user to recognize and detect different areas of the furnaces, access points or even the real effect of the fans in real time, among others. In addition, monitoring systems based on thermal cameras are now profitable thanks to new developments in uncooled microbolometers and the trend towards mass production. The use of thermal monitoring systems is a potential solution to optimize the industrial production processes and reduce the cost of maintenance due to damage and unscheduled downtime.